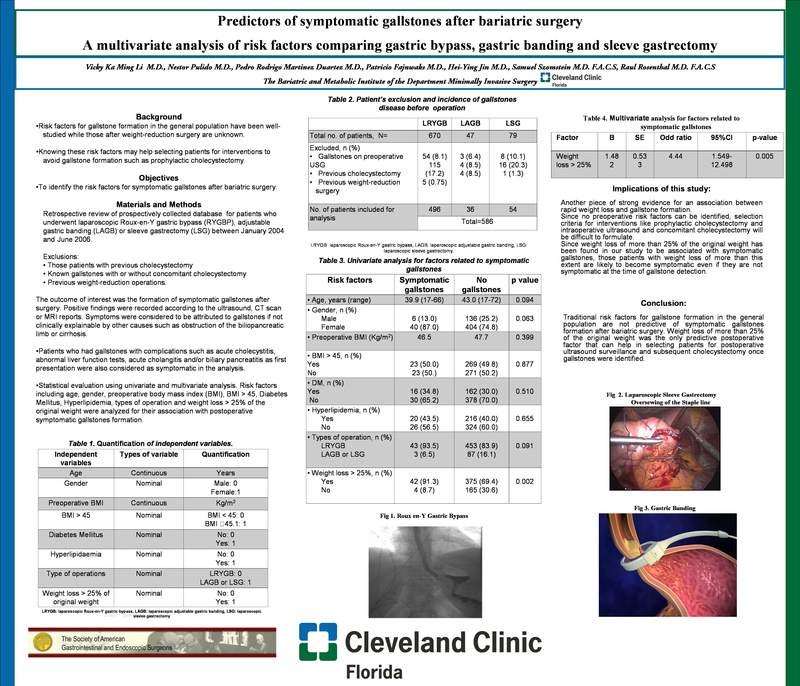 Background: Risk factors for symptomatic gallstone formation after bariatric surgery are unknown. Interventions to detect and reduce the incidence such as postoperative ursodeoxycholic acid and routine postoperative ultrasound surveillance have been suggested but remain controversial. A selective approach guided by patients’ risk factors rather than an algorithmic method may be indicated. Patients and Methods: After IRB approval, a retrospective review was performed for patients who underwent laparoscopic Roux-en-Y gastric bypass (LRYGBP), laparoscopic adjustable gastric banding (LAGB), or laparoscopic sleeve gastrectomy (LSG) between January 2004 and June 2006. Patients with previous cholecystectomy, known gallstones with our without concomitant cholecystectomy, and those who had undergone previous bariatric procedures were excluded. Risk factors including age, gender, preoperative body mass index (BMI), BMI >45, diabetes mellitus, hyperlipidemia, type of operation, and weight loss >25% of original weight were analyzed with univariate and multivariate analysis for their association with postoperative symptomatic gallstone formation. Results: A total of 586 patients were included for analysis and had undergone 670 LRYGBP, 47 LAGB, and 79 LSG at our institution during the studied period. The mean follow up period was 25.9 (12-42) months. The overall rate of symptomatic gallstone formation was 7.8% while the mean time for its development was 10.2 (2-37) months; 1.9% of patients with symptomatic gallstones had complications as initial presentation. Both univariate and logistic regression analysis showed that only postoperative weight loss > 25% of the original weight was associated with symptomatic gallstone formation (B=1.482; SE=0.533; Odds ratio: 4.44; 95%CI=1.549-12.498; p=0.005). Conclusion: Traditional risk factors for gallstone formation in the general population are not predictive of symptomatic gallstone formation after bariatric surgery. Weight loss of more than 25% of the original weight was the only postoperative factor to help in the selection of patients for postoperative ultrasound surveillance and subsequent cholecystectomy once gallstones have been identified.